The Super Eagles of Nigeria will face the Pharoahs of Egypt in an international friendly match in January 2017. The match is expected to hold it Dubai it was also gathered, though a definite date in January is yet to be fixed. According to a media release from the Nigeria Football Federation, Super Eagles coach, Gernot Rohr will use the game to test the home based players who were left out of the Russia 2018 World Cup qualifying match against Algeria in Uyo. “We have a friendly against Egypt in Dubai in January, which will enable me to look at the home-based players, but I will continue to monitor the Europe–based players and we will see how we get matches for them on FIFA free dates," Gernot Rohr revealed after the game in Uyo. 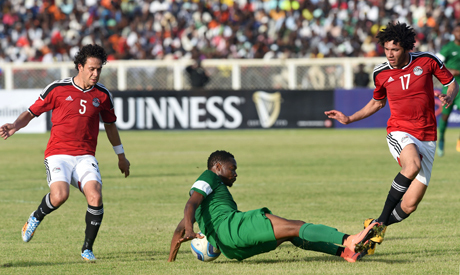 Recall Egypt qualified ahead of Nigeria from the same group for the 2017 Africa Cup of Nations billed to hold in Gabon. Rohr, who took charge of the Eagles in August this year has chalked up three wins out of three matches. Nigeria currently top Group B of the Russia 2018 World Cup African qualifiers with six points, Second placed Cameroon who Nigeria will host in August 2017 are four points behind.